This document describes the step to configure a Check Point using the ThreatSTOP Centralized Manager over CLI. Automated retrieval and updates of IP Defense policies from ThreatSTOP’s systems to the Check Point. Automated collection and delivery of log files from the Check Point gateways to ThreatSTOP’s systems. The integration is performed by a Linux-based virtual machine provided by ThreatSTOP, named ThreatSTOP Centralized Manager (TSCM). After its initial installation, the TSCM will retrieve the list of subnets matching the policy configured via the ThreatSTOP Admin portal and make them available as a new Security Intelligence feed for Check Point. 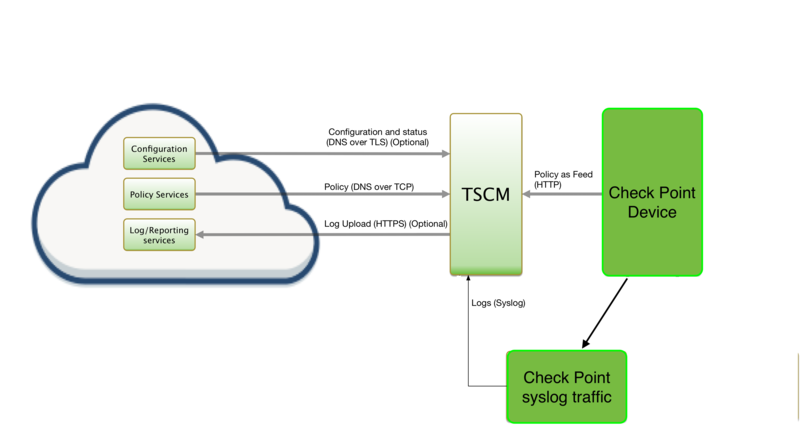 Optionally, the Check Point gateways can be configured to send the connection log events to the TSCM via syslog and the TSCM will package and upload log files to ThreatSTOP’s Portal, for analysis and reporting. Note: Check Point may update these hotfixes and depricate the hotfixes we have listed without notice. Please reference the hotfix knowledge base article sk132193 & sk122323 and look for the latest CPUSE Online Identifier. including hotfix: Check_Point_R80.10_JHF_Hotfix_sk132193_FULL.tgz adds support for 10,000+ Entries. Hotix Check_Point_R80_20_JUMBO_HF_Bundle_T47_sk137592_FULL.tgz adds support for 10,000+ Entries. Install the hotfix(es) via the Check Point Upgrade Service Engine (CPUSE). Important: It is not currently possible to load a ThreatSTOP Allow list (whitelist) on Check Point devices. During this step, you will create a device entry on the Admin Portal. You will select a device type (Check Point) and enter the configuration settings. A minimum configuration only requires a handful of settings but optional, advanced options are also available. After creating the device entry, download and boot the TSCM image. After booting the TSCM and logging in via ssh, the third setup step will link the virtual machine to the device entry created in Step #1. The TSCM has a configuration utility tsadmin (documented here) is covered in full below. Blade: the blade you have activated in Check Point (Anti-Virus, or Anti-Bot). It is fine to have both enabled but only one can be set in the feed per Check Point recommendations. Maximum Policy Size: Option limit on the number of entries in the policy. If the policy becomes larger than this setting, the TSCM will truncate it down to the Maximum Policy Size. Additional syslog source IP(s): Typically, logs will be sent over syslog by the device itself. If logs are sent by another IP address (for example, after being processed by a SIEM, or in High-Availability configurations), that IP address should be configured in this field. High-Availability IP addresses: See HA / Cluster Setup section for more details. The following steps assume that you have admin access to Check Point web interface and have setup an expert password. Some hotfixes are not visible via the normal Check Point Upgrade Service Engine (CPUSE). Follow the guide below to install hotfix(es) not shown in the normal CPUSE interface. On the far left menu, scroll down to “Upgrades (CPUSE)” section and click “Status and Actions”. On the top right click the “Add Hotfixes from the Cloud” button. Select the Hotfix(es) you require to meet the minimum compatibility requirements for your version of Check Point. If you do not see the hotfix listed in CPUSE then click on the “Add Hotfixes from Cloud” button. Copy and paste the hotfix’s name and hit the search button. Select the hotfix from the search result to add it to available Hotfixes Package list. The following steps assume that you have admin access to Check Points web interface and have setup an expert password. Log into the Check Point smart console. Right click on the device’s “Active Blade” column and select Edit. Make sure at least one of the Anti-Virus or Anti-Bot checkboxes is selected. Select the “Anti-Bot and Anti-Virus settings” on the left menu. We want “Activate mode” set to “According to policy”. Finally, “Publish” and “Install Policy” in the Check Point SmartConsole. Log into the Check Point SmartConsole. Create a new policy named “ThreatSTOP-Block” & position above any other policy with Anti-Bot or Anti-Virus active. The policies are read top to bottom. Important: It is important both have ThreatSTOP-Block in the name of the policy & to position the ThreatSTOP policy higher than any other policy with Anti-Bot/Anti-Virus active for our log parser to process the hits. We recommended only enabling the Anti-Virus / Anti-Bot under “Blade Activations” to keep the logging & analysis clear. Verify the Anti-Bot/Anti-Virus settings are set to defaults “Anti-Bot/Virus Blocked” for prevent, & ask is set to “Company Policy Anti-Bot/Virus”. Log into the Check Point via SSH. Activate “expert mode”. If you’ve not set an expert password you may be required to do so before continuing. 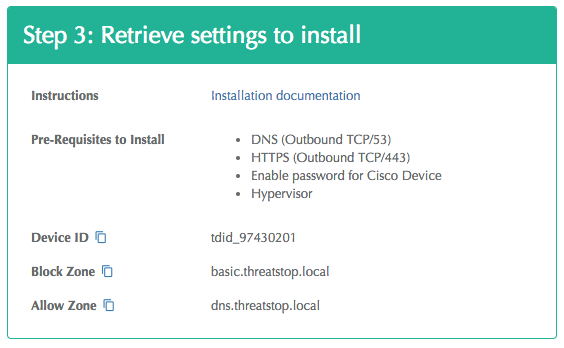 Add the feed as shown substituting your TSCM’s IP address and ThreatSTOP Device ID (TDID). ioc_feeds add --feed_name threatstop-block --transport http --resource "http://<TSCM IP address>:8002/<TDID>/threatstop-block.csv"
The following steps assume that you have admin access to Check Points web interface and have setup an expert password. The syslog feature is available in R80.10 as a hotfix see compatibility section for details and on R80.20 natively (no hotfix required). If no log file is present, check that events are being logged using the Connection Event page (Analysis > Connection > Events) if the policy is configured to log to the event viewr. Also check that the IP address of the gateway is included in the syslog IP setting of the TSCM (account for NAT if applicable) and that the gateway can reach the TSCM over TCP/514. A single TSCM and a single device entry can be configured to publish a policy to multiple Check Point devices. 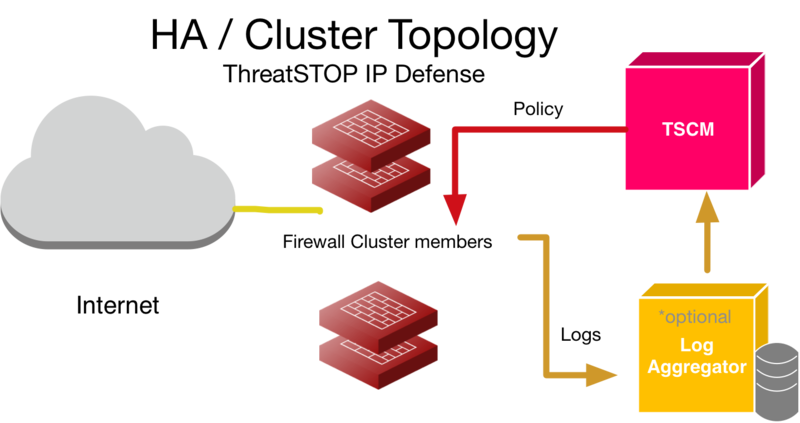 In this configuration, the same policy will be made available to each gateway, and logs for every gateway will appear under the same, unique device entry in the ThreatSTOP Reports. If you configure logging for upstream analysis and you would like to see it broken down by device, create device entries to get unique TDIDs for each device. You can Create and distribute one Check Point “Threat Prevention” policy to multiple devices. If you run multiple devices with the same TDID entry such as in an HA setup see the HA configuration section for installation steps. Run the tsadmin add command with the --advanced flag so you get advanced feature prompts, be sure to enter a space separated list of all HA cluster member IP addresses as observed by the TSCM. Install the log export hotfix listed in the requirements section on that device VS. the firewall cluster members. 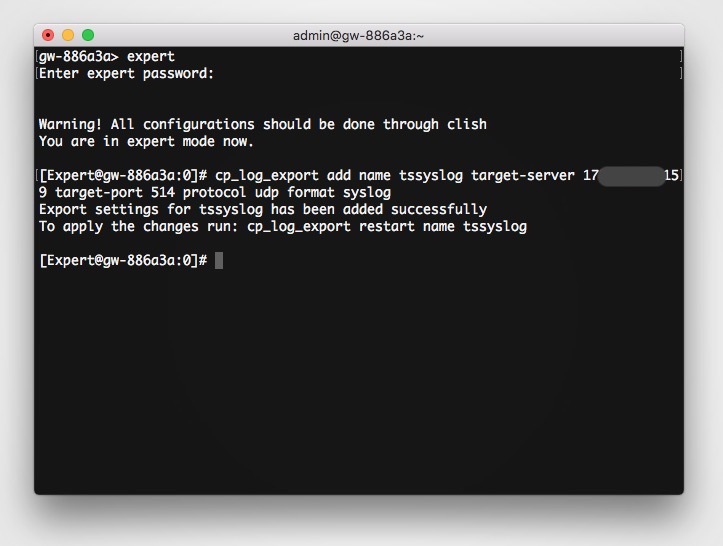 Run the tsadmin add command with the --advanced flag to add the IP address of the log aggregation server(s) in the Syslog IP address prompt. Run the log export setup on the Security Center / log aggregation server. To disable the integration on the Check Point firewall, the first step is the removal of the feed from the device using the ioc_feeds utility. The Check Point gateways will stop enforcing blocks once the ioc_feeds are removed. If you setup logging run the following to uninstall it. Change tssyslog to whatever you named the logging profile. Next, remove / rename the policy created in Step 6. Delete the device on the TSCM. This will stop policy retrieval and log forwarding. Failure to block traffic from Check Point firewall. Check in SmartConsole > Gateways & Servers > Right click on “Activated Blade” column > Edit > Anti-Bot or/and Anti-Virus checkbox is selected & “Anti-Bot and Anti-Virus” Activation mode is set to “According to policy”. # grep - will filter the policy for a target. Verify the IP Address you are testing with is listed in the file.